^ I don't know, does it have to be a new track / car variation, or could it possibly tie into this "physchocoaster" concept and count that as an element of the ride? Well as we know the car cant be too amazing because of the strength of the track, i would think its the cars because of the truck load pictures we saw of the SW. So that could be cars in there or is there something going to happen inside the building that makes it unique? Theming has begun on the turn before the lift hill. Pillars surrounding the turn covered in snow. Wooden shuttering assembled for concrete to be poured for more theming. Also notice the new steel structure above. ^^ I haven't been keeping up with the construction, but if the track we've seen is near completion and there's nothing new there, then it's safe to say this unique element happens indoors or underground. Those pillars in my opinion will be reinforcement rather than theming. Could indicate that this section will be underground too, still it's another new angle of the ride! Just to let you know, that is the final turn which will be taken backwards, and yes, it is believed it will start out underground and maybe end up above ground.. ...Looking good so far though, can't wait to ride in April....wish I could get there earlier, but not looking like it at the moment! I think there will be the secret element in the backwards turn(as we see in the photos) or the backwards turn to show the car running away from something in the building because we know after the turn it then enters the station. I think there will be a really bug animatronic or a big projector screen and something will try to attack us. Dobba wrote: Those pillars in my opinion will be reinforcement rather than theming. 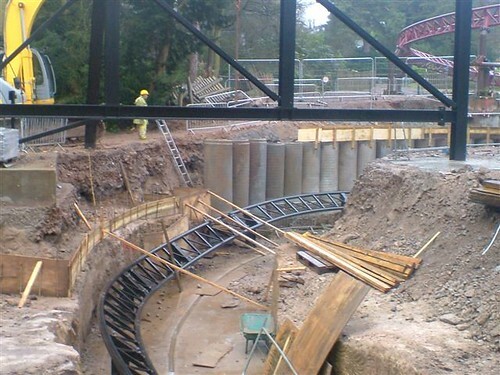 Could indicate that this section will be underground too, still it's another new angle of the ride! Or they could be both. 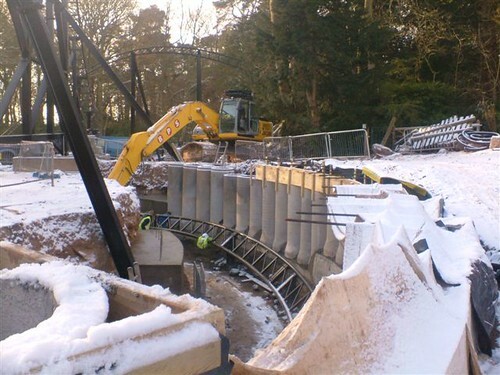 Caption: Workmen take a break from the construction of new ride, 'Th13teen' at Alton Towers in Staffordshire, to play with a snow sculpture version of the roller coaster carriage that they helped to build. Now we know the secret! The Secret Weapon is.......trains made out of snow! Now that I did not expect!